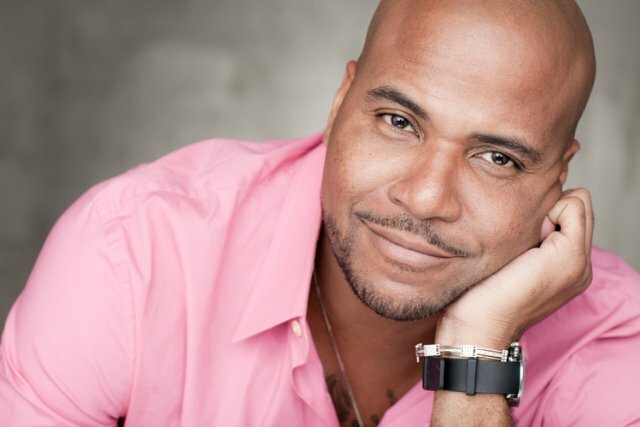 As Sci-Fi Honey 2.0 and I made the rounds at WSCSF, we had the unique opportunity of meeting Vincent M. Ward. 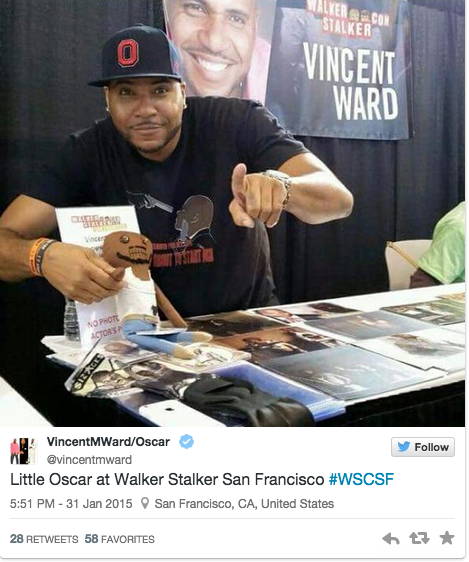 Fans of The Walking Dead will know him as Oscar, one of the prison inmates that Rick and the gang met. During our conversation, Katie and I were instantly taken by his truly wonderful attitude and outlook on life. I was reading that you like to dance? Yeah, I actually started off in a rap group. We used to open up shows for like Salt n Peppa, Heavy D and The Boyz. I was one of the dancers in our group, The Slam Syndicate and me and my old dance partner, we would win every dance contest in the midwest. He's 6'4 and I'm 6'5 and they actually called us the Twin Tower Dancers, but we went by "Night and Day". So, that's where my entertainment came from. I never thought about being an actor. It was either basketball or dancing. Does everyone assume you're going to do basketball because you're tall? Pretty much, but I'm only 6'4". If I was in the NBA I would be considered short, I would be a point guard. Back in the day I probably got letters from every college in the United States, but I didn't want to go straight to college. I wanted to tour with my rap group and my parents hated it. They were like, "What are you doing?" and then a couple of years after being out of high school, my coach just happened to call my mom one day and asked, "Does Vincent still play ball?" She says, "I think so," and he says, "Well, we want to give him a full ride. We haven't seen him play in a couple of years, but we want to give him a full ride to our college." So, that's what brought me to college." So, what did you do there? I didn't do nothing with that, but you know what? Being from Ohio, one of the big jobs that you usually have is working at General Motors. So, I had the opportunity to work at GM. I got hurt on the job and I couldn't come back and this is Dayton, Ohio so I'm like, what am I going to do with my life? I started working at Champs Sports, became number one salesman in the district there and they wanted to train me for an assistant manager position, but you have to go to Columbus. So, I went to Columbus and became the number one salesman there and one day the general manager came and says, "You know, you're doing a great job. How far do you want to take it in the company?" I said, "I'd like to have a position like yours one day." Two weeks later, I was fired. I asked my manager why I was fired and he said, "Vince, whatever you said to the general manager is why you got fired." Two weeks after that, I went and saw my very first play. I had never seen a play in my entire life. Went in there, a little theatre, and I fell in love. I fell in love with acting that day. A couple weeks after that, I went and auditioned for that same play company. I had never acted before, got a part and who calls and tries to offer me my job back? Champs Sports. I said, "No, I've found something I love to do" and so after that I started doing more plays and I auditioned for an independent film and I got the lead role in it. That was my first time I ever auditioned for a movie or anything big. Got the lead role in that, started doing more auditions, doing more plays and then the movie Traffic with Michael Douglas came along. I ended up getting a part in that and that's when I told my parents I was moving to L.A.
What was the play that you saw? It was "Our Young Black Men Are Dying and No One Seems To Care". This guy, he did educational plays. He would go to different colleges and perform the plays. His name was James Chapman. That's what did it. I remember one day, someone said, "Man, you're going to L.A., but if you don't make it, what is it that you have to fall back on?" I said, "Nothing. For the first time in my life, I'm going to fall on something that I want, that I love and I'm proud to say that I have a career and not just a job. I never had a career before. I never had the love and passion for something like I have for this." You know, I always tell people, "I don't want to just play Oscar, I want to win an Oscar." That's my goal. I don't just want to be on somebody's show, three or four episodes. I'm grateful if I get that, but I want to be on somebody's show from the beginning to the end. That's the goal. I'm not an attention whore, so just being on something for a short time doesn't matter. I want it to be relevant. I want to be able to go home to Dayton, Ohio and people feel like they're proud of me. So, you would prefer to be on television rather than in movies? I just want to work. You know, I love theatre. I have a play coming out next week in Los Angeles. I would rather do theatre than anything. Really? What is the play coming up? It's called "The Conversation". It's February 6, 7, and 8th and then the following weekend. It's based on domestic violence. It's from director Tasha Biltmore and it's based on her life. She went through some things and I'm playing her ex husband and in the play I take her through it. I mean, there are some situations where I look at her and I say, "How did you stay? How did you not kill him?" I don't believe in hurting people, but when someone is doing all of the things that I'm doing to her in the play......... bad, bad, bad man. So, is it hard for you to be that guy? Nope. No, it's not because I'm the type of actor, when the director says, "I need you to do it this way," I just do it. I just took my first acting class last week. I've never had acting classes in fifteen years, so I went to my first acting class last week. It was cool, but I was a little nervous. I've done a lot of stuff before The Walking Dead, so of course they wanted to put me in the advanced classes. I said, "No, I want to start from the beginning." Maybe I'm missing something, you know? Honestly, I was little nervous because everyone in class knows about bringing it and for me not to know how to bring it to every class, they're thinking, "How did he get in here?" You were in Traffic. Did you pick up anything just being in the general area of these actors? I picked up that I wanted to try harder. I picked up, "You can do this." I picked up, "Why not me?" You always got to be on your "A" game. I always say, "Rise and Grind. Be ready so you don't have to get ready." A lot of people say they're ready for the next level and they want to live this lifestyle, but do you really want to? A lot of times, some of your privacy is gone. You have to be a certain way, try not to piss people off and it all comes with the territory. Even with these conventions, you have to be able to meet and greet without having the attitude or making people feel like they're just money. I always tell people, "Don't say you're my fan. Say we're social media family because I don't want you to feel you need to put me on a pedestal or anything like that. I'm just on a show that you like. I'm no different from you and you're no different from me." I just try to be an inspiration to people. No funny stuff, no ego, no nothing because this stuff can be taken away just like that. (snaps fingers) One of my favorite rappers back in the day, I loved him because of his voice. He gets in a car accident and what goes? His voice. Life is short and you better enjoy it while you can and try to treat people right because karma is real. Karma is real and you might get away with something today, but it will come back on you later on. I don't care if it's two, three, four, five years and if it doesn't happen to you, it might happen to someone that you love. Well, think about O.J. Simpson. He has a lot of karma still to pay don't you think? Well yeah, but he's (we both say this in unison) in jail for stealing his own stuff!! Look at what just happened with Suge Knight. Suge Knight has been blamed for killing two of the best rappers ever. Biggie and Tupac. What happens to him this week? He gets into a scuffle with somebody and gets to the point where he has his buddy with him and what happens? He runs over his buddy and kills him. Now, he's about to go to jail forever. It's part of that karma for all of that other stuff he got away with. Well, we don't know that he did it. We don't want him holding you outside of a window..
Why do you prefer theatre? I love the audience reaction. To hear their "ooh's and aww's" and "boo's." Oh yeah, if you're playing the bad guy and you really portray it right, they'll boo you. Yeah, my parents boo'd me. They're like, "I love you, but I hated you in the play." I'm like,"thank you mom and dad." So, they've been really supportive? Yeah. Big support system and my thing is, I want to take care of my parents. They've been there for me for 44 years. I have five grandkids and I want to be that granddad that leaves something for my children. 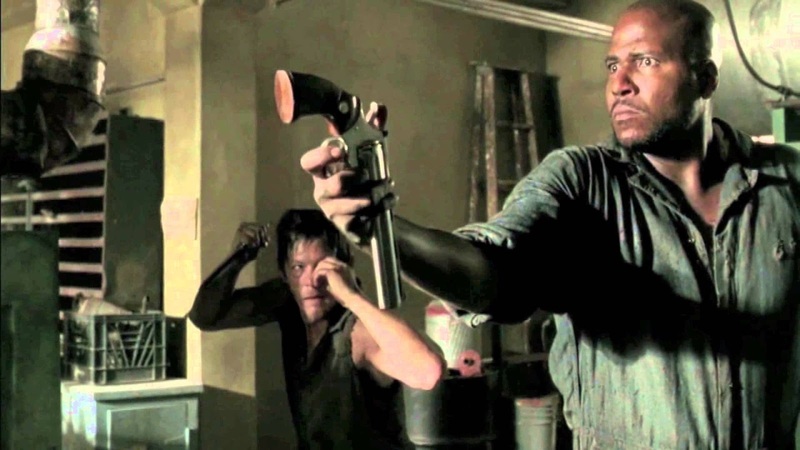 So, I have to ask you at least one Walking Dead question. We didn't see you die. You and a lot of other people didn't see it. There's a lot of people who have said the same thing. So, I guess it's up to The Walking Dead or AMC to bring Oscar back. There was a petition going around for a while, actually. (To bring Oscar back). Like, my mom and dad, they didn't want to see it because they knew I got shot. So it took them a while to watch the show. So, when my parents finally watched me get shot, my mom was like, "Did you get shot?" I didn't even realize that (sic) my death wasn't finalized until the people from social media said something about it. No, I knew I got shot, but they didn't show afterwards. We didn't see you reanimated. That means you could come back. Who knows. Would that be interesting to you at all? I would be grateful. I would love it, but if it doesn't happen, so be it. I'm grateful for my time on the show. If it wasn't for the show, I wouldn't be here now. Do you enjoy the conventions? I love it. I love the whole meet and greet, interacting with people.